If you give your air conditioner the care it deserves with regular cleaning and maintenance, you should enjoy a long and happy relationship free from problems. If you do notice the system behaving unusually though, it's important to call a licensed air conditioning technician right away, rather than trying to fix the problem yourself and potentially making things worse or putting yourself at risk. Here are five common air conditioning problems that can affect the unit's performance and even cause permanent damage if they're not repaired quickly. You can minimise the risk of these faults occurring by having your air conditioner serviced regularly, especially before the hot weather arrives. If no cold air is coming out of the unit, there could be a few explanations. One of the most common is that ice has formed inside, which should be visible when you lift the cover. Ice can form if you don't clean the filter regularly, which blocks the flow of air and hinders the unit's performance. Switch off your air conditioner and wait for the ice to melt naturally, placing a bucket or towel underneath to collect the water. After the ice has melted, you should clean and dry or replace the filter. If your air conditioner freezes regularly, you should call in a technician to diagnose and fix the problem. If your AC pipelines spring a leak, this will prevent the refrigerant from reaching where it's needed. The refrigerants used in air conditioning systems are expensive to replace and extremely damaging to the environment if they get into the air. As soon as you spot a leak, you need to switch off the unit and call a technician to repair it as quickly as possible. If the thermostat sensor develops a fault or gets knocked out of position, your air conditioner won't be able to regulate temperatures effectively. This can lead to uneven cooling or the unit constant cycling. Replacing or moving the thermostat is a technical job that requires the expertise of a professional. If your unit suddenly starts making loud banging noises, this usually means the fan belt has become dislodged. The motor bearings may also need to be replaced. Switch off the unit and don't use the air conditioning again until a professional has had a chance to fix it, or you could make the damage worse. Sometimes, it's easy to overlook the little things. One of the most common reasons air conditioners develop a fault is because the filters get clogged with dust and dirt. This also reduces their efficiency and will drive up your energy bills. You should clean your filter (or replace it, in the case of disposable filters) at least once a month if you use your air conditioner regularly. If you have pets that shed a lot of hair, or there's a lot of dust entering from outside, you should do it even more often. How can I prevent air conditioner problems? 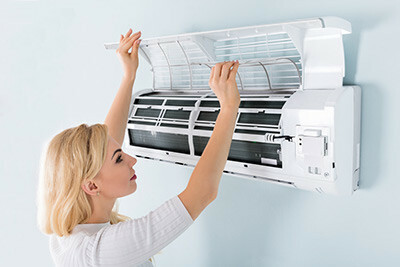 When your new air conditioner is installed, you should arrange regular cleaning and servicing to make sure it's always operating at its peak and to reduce the chance of things going wrong. ← How energy efficient is an air conditioning unit?